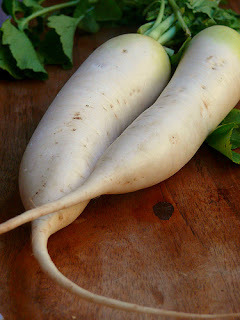 Awhile back I got a few daikon (Japanese for “large root”, and they also made me think of “the radish spirit” in Spirited Away) radishes in my Bountiful Basket. When I saw it I thought “What is this and what in the world do I do with it?” I let them set in my fridge for almost a month before I forced myself to do something with them. Most suggestions that I found involved turning into sweet pickles or some sort of sweet pickle salad. I hate sweet pickles, so I kept searching. I found a recipe on Root Simple, that involved cutting them into strips and pickling them. Now when I say pickling, I mean really pickling. Not the cold pack preserving that we Americans of the 21st century think of when we think of pickles, but letting the naturally occurring bacteria multiply and produce lactic acid. This lacto-fermentation is the same process that is used to make sauerkraut, Swiss cheese and sourdough bread. This is the way that dill pickles are traditionally made. So I thought I would give it a whirl with a few minor modifications of my own. 1. Mix salt and water. This will be your brine. 2. Cut radishes into small strips. 3. Stuff garlic and radish strips into a very clean quart mason jar. (I sterilized it just to be safe.) 4. Add dill and cover with brine. Make sure that all of the vegetables are covered with the brine, if they are exposed the entire jar may spoil. 5. Let set for 1-4 weeks depending on how strong you want your pickles to be. Oh and your brine is supposed to get cloudy. That’s how you know it’s working, and if you put your jar through a hot water bath it will kill the bacteria that are doing the lacto-fermenting. Refrigerate after opening. When we opened them they popped a fizzed quite a bit, but tasted like pickles, only with a different texture. When I chopped up the radishes there was some leftover, so I ate a few raw. It kind of reminded me of a cross between jicama and a radish. Chopped a few into a salad.